We just got back two days ago from a most amazing adventure in Italy!! We had a tremendous time. My mind in still in overdrive with all of the incredible sites. The food, of course, was unbelievable!!! What struck me in particular besides the obvious (pasta and gelato) was the coffee! I’ve had a love affair with coffee for a very long time and I have to say that I don’t think I’ve enjoyed coffee more anywhere in the world. Italians are serious about their coffee and they know how to do it right! In fact, we didn’t see one Starbucks and to my knowledge, Starbucks does not exist in Italy…yet! That’s because Italians do coffee their way and I got to say, it’s darn good! 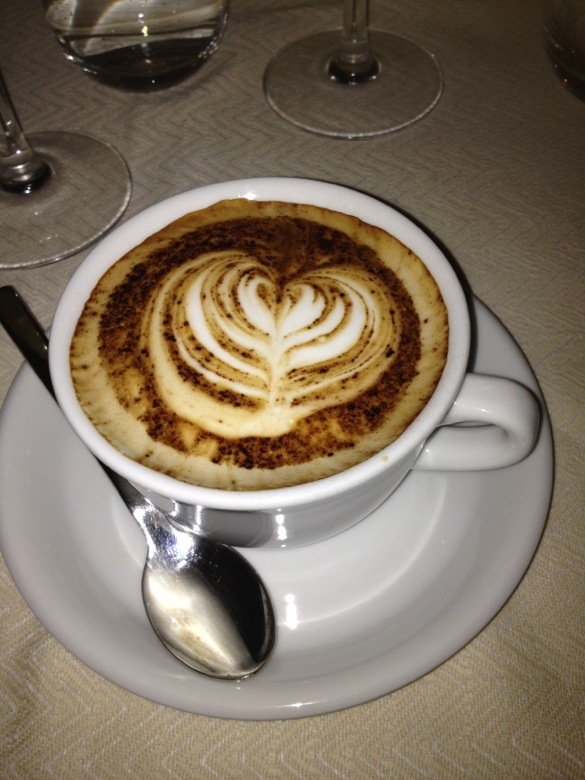 This was my first cappuccino in Italy. Very artistic with the light dusting of cacao (cocoa) over the design. Stunning! It seemed that cappuccinos and espressos are the most popular types of drinks. You can’t specify a size and there aren’t any syrups added. Most cappuccinos are about 5-6 oz. compared to a grande at Starbucks which is 16 oz! Maybe that’s why so many Italian women are slim! A cappuccino is often finished off with a design in the foam, a dusting of cocoa, and it’s always served in a cup and saucer with a spoon and usually a packet of sugar. We paid anywhere from 1.50 to 3 Euros for a cappuccino (that would be between $1.80-$3.60). I was totally enamored by the designs on the cappuccinos I ordered. Another thing that I noticed is that there is no such thing as a coffee to go. Paper cups are virtually non-existent. Locals walk up to the counter at the closest shop or restaurant, order an espresso or cappuccino, drink it standing at the bar and go. 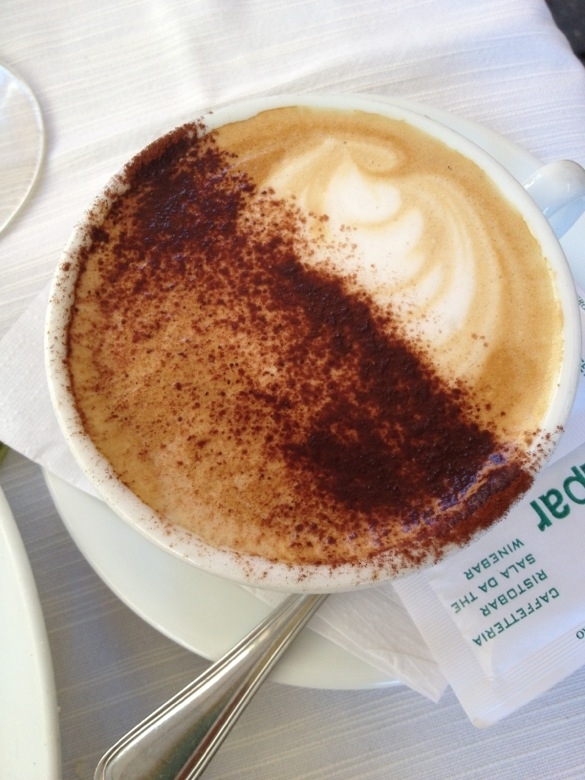 Italians really savor their coffee. 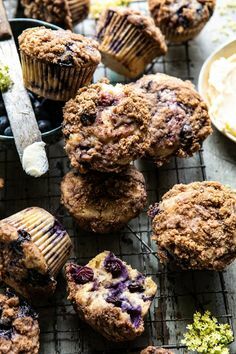 It’s a mini break in the middle of the day! And they don’t order any snacks or treats usually…coffee is the treat! Hmmm….something I could learn from! 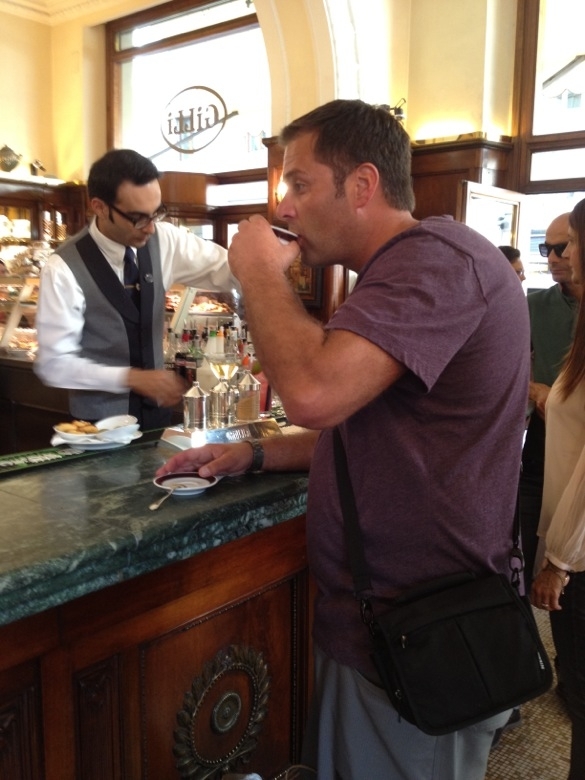 Jason standing at the bar at Gilli in Florence drinking his espresso, just like a local. Coffee is readily available in Italy. We stopped at the tiniest village on our way from Rome to Tuscany…I’m talking we drove up a dirt road and the village had one restaurant. But even that restaurant had a full commercial coffee maker and locals dropped by to drink their espressos at the counter. 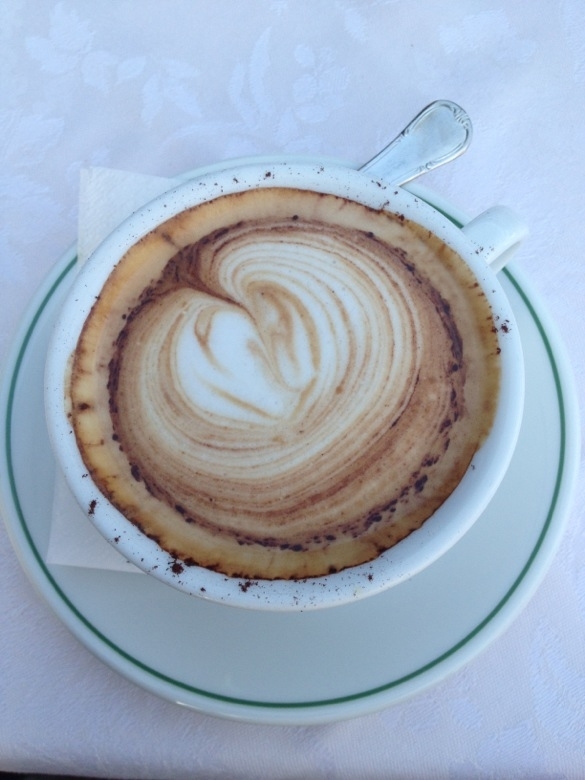 I’m usually a latte drinker, but I thoroughly enjoyed the cappuccinos in Italy. A traditional cappuccino is 1/3 espresso, 1/3 hot milk and 1/3 foam. I attempted to make one last night at home, but I’m going to have to work to perfect the art of it! Stay tuned…. The heart design on this cappuccino lasted almost until the very last sip! The perfect ending to a delicious meal!